Photo Credit: Peter Rejcek Glaciers and ice-covered peaks in the central Transantarctic Mountains. A recent study that looked at satellite data says ice loss from Antarctica and Greenland is now the main contributor to global sea-level rise. 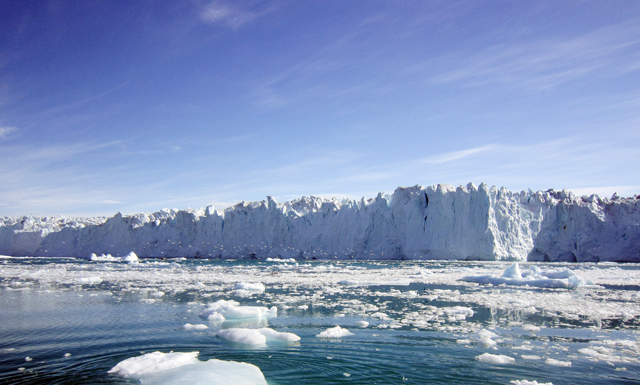 Ice loss from the Greenland and Antarctic ice sheets is rising to the top as the main contributor to higher sea level. 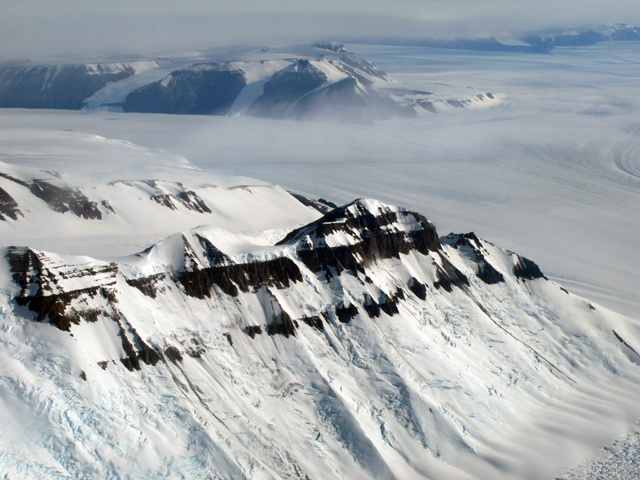 A new study published this month in Geophysical Research Letters, a journal of the American Geophysical Union , says ice sheet mass loss is accelerating. Ice sheets are overtaking Earth’s mountain glaciers and ice caps to become the dominant contributor to global sea level rise, much sooner than model forecasts have predicted. Each year over the course of the study (1992-2009), the two ice sheets lost a combined average of 36.3 gigatonnes more than they did the year before. In 2006, the total loss was 475 gigatonnes, enough to raise global sea level by an average of 1.3 millimeters. That’s compared to 402 gigatonnes from mountain glaciers and ice caps, with a year-over-year acceleration rate three times smaller than that of the ice sheets. “That ice sheets will dominate future sea level rise is not surprising — they hold a lot more ice mass than mountain glaciers,” said lead author Eric Rignot, of NASA’s Jet Propulsion Laboratory , Pasadena, Calif., and the University of California, Irvine . Rignot said in a press release from AGU that if the present trends continue, sea level is likely to be significantly higher than levels projected by the United Nations’ Intergovernmental Panel on Climate Change in 2007. That report predicted the global sea level could rise by as much as 59 centimeters by 2100. Since then, a number of studies have suggested that prediction is too low, forecasting sea level may grow between 1 and 3 meters by the end of the century. “Our study helps reduce uncertainties in near-term projections of sea level rise,” Rignot said. The study’s authors combined nearly two decades of monthly satellite measurements with advanced regional atmospheric climate model data to examine changes in ice sheet mass and trends in acceleration of ice loss. They found that for each year over the 18-year study, the Greenland ice sheet loss mass faster than it did the year before, by an average of 21.9 gigatonnes a year. In Antarctica, the year-over-year speedup in ice mass loss averaged 14.5 gigatonnes. The authors conclude that if current ice sheet melting rates continue for the next four decades, their cumulative loss could raise sea level by 15 centimeters over that period. Glacial ice caps are projected to add 8 centimeters during that time, with thermal ocean expansion adding 9 centimeters. Total sea level rise could reach 32 centimeters by 2050, based on the predictions. The authors cautioned that considerable uncertainties remain in estimating future ice loss acceleration.